The Irish Music and Dance Association is pleased to honor and remember Tim �Fitz� Fitzgerald by making a very special opportunity available to two young bagpipers. 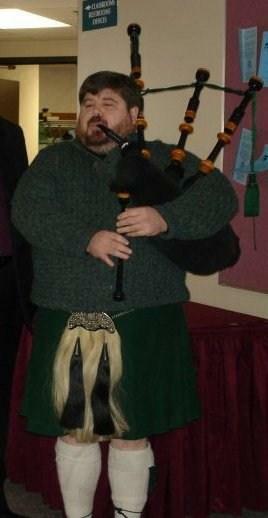 (Fitz played a key role in the Twin Cities Irish music community as a promoter of Irish music, coordinator of bands for Kieran's Irish Pub, Chair of the Entertainment Committee for Irish Fair Minnesota and as a singer and piper in his own right. Fitz passed away suddenly in March 2010 and is greatly missed.) In his honor, the IMDA Educational Grant Program sponsored two young pipers at the prestigious Balmoral School of Piping in 2010. 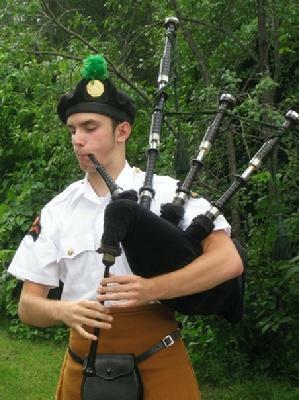 Normally pipers must travel to Pittsburgh to take advantage of the outstanding instruction offered by the Balmoral School. Beginning in 2010, the Balmoral began offering instruction locally at Macalester College. The students spent a full week in small group instruction, learning from some of the best piping instructors in the world. The two pipers are Anthony Howe, a sophomore from Somerset, WI who pipes with the Brian Boru Irish Pipe Band and Silas Ohman, an eighth grader from Long Lake who pipes with the Minnesota Police Pipe Band. Both of these outstanding young men have worked to master a very challenging instrument and both have received the highest recommendation from their Pipe Majors. Both expect to learn a great deal in their week with Balmoral and expect to bring their new expertise back to help improve their bands. Anthony plays several other instruments, including guitar, sax, tin whistle, and harmonica, as well as making time for varsity soccer. He became interested in the pipes in part because of his Scottish heritage and in part because he felt confident that he could use his �good ear� to take on another instrument. Anthony has competed at the Minnesota Scottish Fair band competitions with the Brian Boru Irish Pipe Band and has enjoyed seeing the band increase their playing ability every year. Two years ago he competed solo in Grade IV and took first place. Anthony has also successfully taught bagpipe lessons through the Brian Boru Irish Pipe Band to many students, some well over twice his age. At the Balmoral School, Anthony hopes to gain insight on playing traditional bagpipe music and to further his competition skills. Silas started playing the pipes two and a half years ago, working through the different chanter lesson levels, and began on the pipes last summer. Silas now practices with the Grade 5 Pipe Band and will be competing with them at the Highland Games in Farmington. Silas became interested in the pipes when he was about 6 or 7 and heard them at a library presentation (and then had to wait a couple of years to be old enough to begin lessons!). He says �they were the coolest thing ever and I loved their sound from then on.� Silas also says that he once brought his pipes to school on a dare from his social studies teacher: as he played for his class, kids from all the other classes on the floor came running to hear. At the Balmoral School, Silas hopes to develop a better ear for how the music should be played, and learn how to play the bagpipes with a really steady tone. IMDA is pleased to make this opportunity available for two outstanding young students of the Great Highland pipes. These grants reflect IMDA�s commitment to supporting those who study and participate in the traditional arts of Ireland and our deep appreciation for all that Fitz did to support and encourage Irish music in our community. Anthony and Silas are part of a great tradition. Anthony and Silas shared their new skills at IMDA Honors Paddy O'Brien in October, 2010 by piping Paddy into the hall for the celebration and then playing a few tunes.